Every purchase helps feed and take care of children that desperately need help (amazima.org). 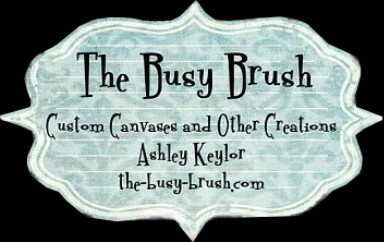 Welcome to the Busy Brush Blog. My name is Ashley Keylor and I have loved all things creative for as long as I can remember, especially painting. I will basically paint anything that doesn't move and possibly some things that do :). I have done several canvases, growth charts, stools, cork boards, backpacks, shirts, and wipee cases. Each item is hand painted and therefore unique. I can create a painting from a color scheme, a theme, a piece of material, or just an idea that you want to see realized. I want to serve the Lord in all that I do, and will do my best to make sure you are completely happy. Please let me know if I can do anything for you. It would be a pleasure. what you are wanting and will give you a price quote. All prices will be approved by you before the work begins. *All canvases have staple free finished edges. *Add coordinating ribbon to hang the canvases for only 5.00 per canvas. $10.00-15.00 for medium packages, and I can't give a guesstimate on the larger packages due to the various sizes and irregular shape of the packages.